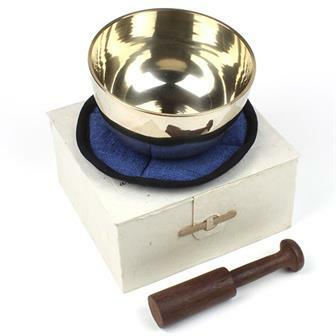 We stock a huge number of singing bowls and are pleased to be able to offer a full range from the basic beginner's boxed set to the highest quality hand beaten bowls. We also regularly stock a wide range of very special and unusual bowls. 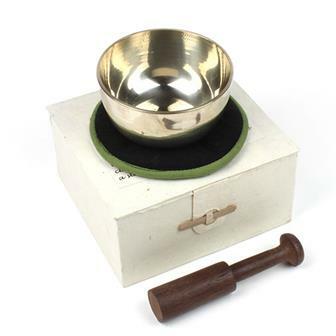 These machine made, black coloured singing bowls are beautifully adorned with Buddhist symbol relief work showing the original metal colour beneath. 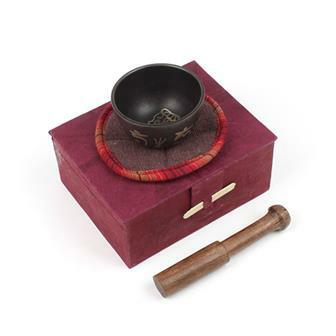 This little gift set contains a small singing bowl, wooden striker (puja stick) and cushion, beautifully presented in a Himalayan lokta paper box. 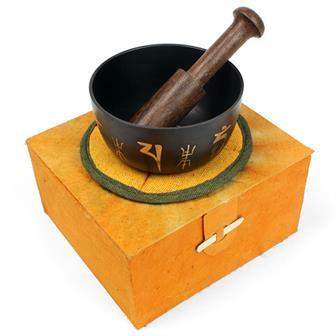 These machine made, black coloured singing bowls are beautifully adorned with Buddhist symbol relief work showing the original metal colour beneath. 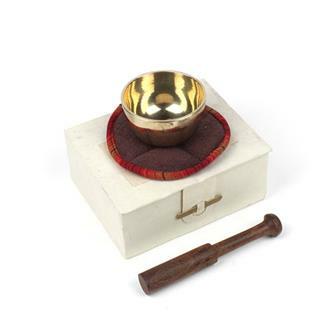 This little gift set contains a medium singing bowl, wooden striker (puja stick) and cushion, beautifully presented in a Himalayan lokta paper box. 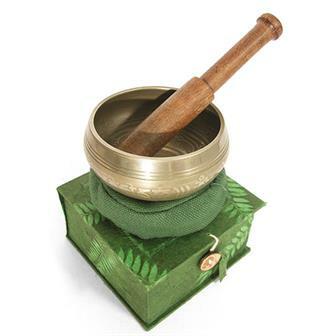 A great sounding bowl kit for those interested in aspects of Tibetan Buddhism, meditation, energy healing or sound therapy. 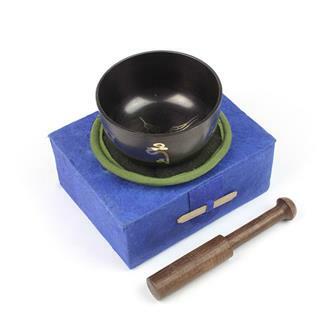 A popular large singing bowl gift set with a etched patterned black bowl, cushion and wooden striker presented in a hand made Himalyan lokta paper box with information. Etchings vary but will represent themes from Tibetan Buddhism. 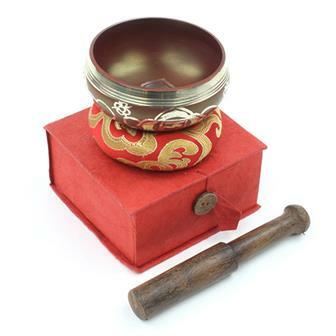 Our very popular etched singing bowl set in beautiful deep red is presented handmade lokta paper box. This set is then completed with a cushion and striker. 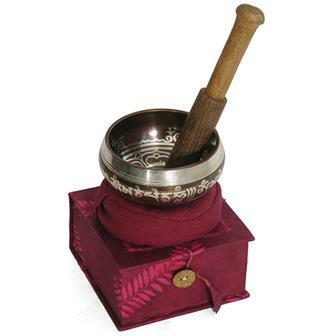 Etched singing bowl set in beautiful green handmade paper box. Comes complete with cushion and striker. 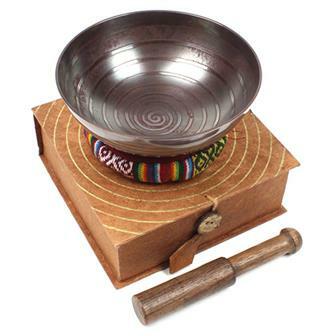 These singing bowl sets are of the highest quality, each highly decorated bowl has a pattern inlayed in the bottom of the bowl as well as around the outside. Comes in a lovely hand made paper box with stick and cushion. A lovely shallow bowl with oxidised spiral design on the inside. 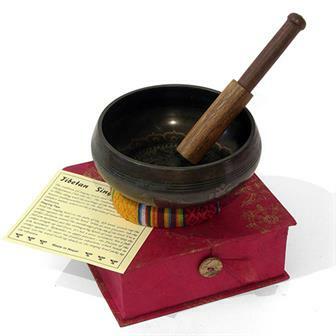 Comes complete with traditional Tibetan fabric fat cushion, striker and info card. Part of our 'Chakra Collection', this bowl has a Root Chakra design. 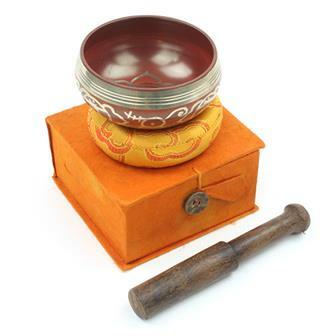 Each bowl comes with a stick and cushion and is presented in a beautiful handmade Himalayan lokta paper box. The Chakra Collection is also available as a full set. Part of our 'Chakra Collection', this bowl has a Sacral Chakra design. 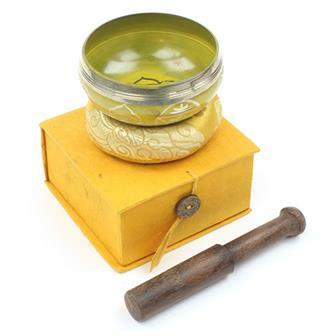 Each bowl comes with a stick and cushion and is presented in a beautiful handmade Himalayan lokta paper box. The Chakra Collection is also available as a full set. 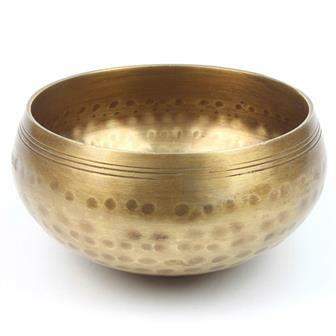 Part of our 'Chakra Collection', this bowl has a Solar Plexus Chakra design. 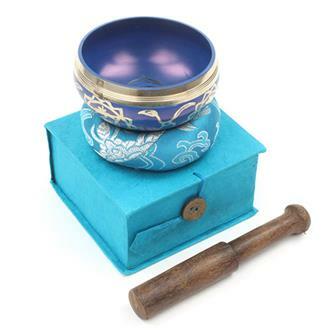 Each bowl comes with a stick and cushion and is presented in a beautiful handmade Himalayan lokta paper box. The Chakra Collection is also available as a full set. 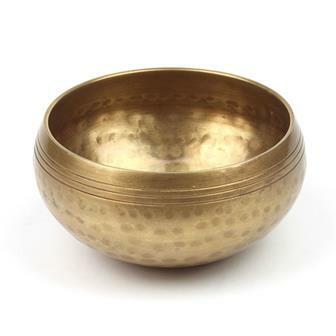 Part of our 'Chakra Collection', this bowl has a Throat Chakra design. 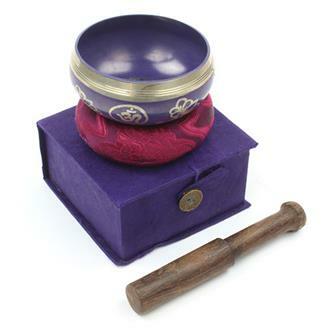 Each bowl comes with a stick and cushion and is presented in a beautiful handmade Himalayan lokta paper box. The Chakra Collection is also available as a full set. Part of our 'Chakra Collection', this bowl has a 'Third Eye' Chakra design. 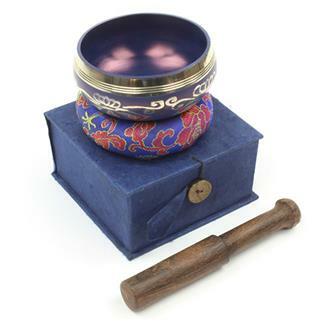 Each bowl comes with a stick and cushion and is presented in a beautiful handmade Himalayan lokta paper box. The Chakra Collection is also available as a full set. Part of our 'Chakra Collection', this bowl has a 'Crown' Chakra design. Each bowl comes with a stick and cushion and is presented in a beautiful handmade Himalayan lokta paper box. The Chakra Collection is also available as a full set. 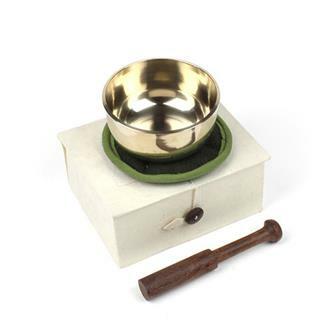 Simple and elegant modern machine made singing bowl produced in India. Each bowl is decorated with dark finish with shows through handpainted symbols. Supplied with a wooden striker.